Burbank Boulevard at Fulton Ave – SP 2658, originally uploaded by Terry Guy. 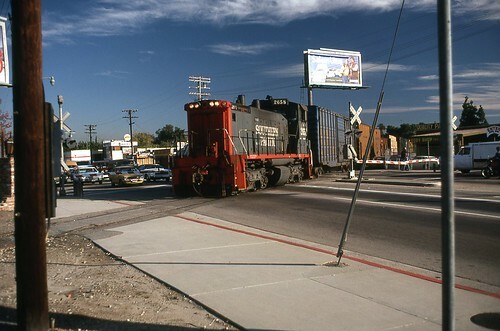 Terry Guy has an excellent collection of photos on his Flickr page chronicling North Hollywood and the old Southern Pacific line which ran along today’s Metro Orange Line Busway. Photo above (near Valley College) is the intersection now converted into a landscaped bike/bus transit line. Life has improved (sporadically and unevenly) in parts of Los Angeles, due in large part to investment in public transportation, which has lead to greater vitality and revitalization in formerly neglected parts of the city. One can see evidence of that in Mr. Guy’s historic North Hollywood images.